Powerless to do anything, all he could do was watch his home destroyed by the Heartless as he escaped with his friends to Traverse Town. Wielder of the Gunblade, Squall Leonhart, changed his name to Leon as a sign of his resolve to become stronger. Leon is first mentioned in King Mickey's letter, in which the King instructed Donald and Goofy to search for him to can find the "key". Sora is unexpectedly challenged in a duel by Leon shortly after he arrives at Traverse Town. After the quick scuffle to test Sora's abilities, Leon and Yuffie clear things up and tell Sora about the Keyblade, the Heartless, and Ansem. They were about to meet up with Aerith, but several Heartless attacked. Leon told Yuffie to get to safety while he and Sora took care of the monsters. Once the threat was resolved, Leon encouraged Sora to join Goody and Donald especially if he wanted to find his friends. Before leaving, Leon, Yuffie, and Aerith gave Sora a few gifts and some words of advice. After finding a strange gummi block, Sora flew back to Traverse Town thinking that Leon could help. The trio found him and Aerith at the Secret Waterway. Leon and Aerith were happy to know that the Keyblade was able to lock the worlds' Keyholes and explained how the Heartless use the Keyholes to invade the worlds and destroy them. Leon reminded Sora of the importance of his mission and told him to see more worlds. Sora asked about the gummi block, but Leon didn't have any answers. Instead he gave Sora a mysterious stone that he had been using as a good luck charm, although he didn't know how to use it, too. Sora later finds out about what happened to Leon and the others and their home world. When things went from bad to worse during his first journey to Hollow Bastion, Sora managed to return safely to Hollow Bastion and told Leon and the others all that happened. There was no choice but to go back and to seal the Keyhole. Leon knew that Sora was also worried about Riku, but he was also certain that Sora would be the one to save his friend. Leon, Aerith, and Yuffie also went to Hollow Bastion much to Sora's surprise. It was time to reclaim their home. However, it was also time for goodbyes. "We may never meet again, but we'll never forget each other," Leon tells Sora before wishing him good luck. Their home finally free once again, Leon was able to see Cid again when the pilot came back to Hollow Bastion - and Cloud, too. 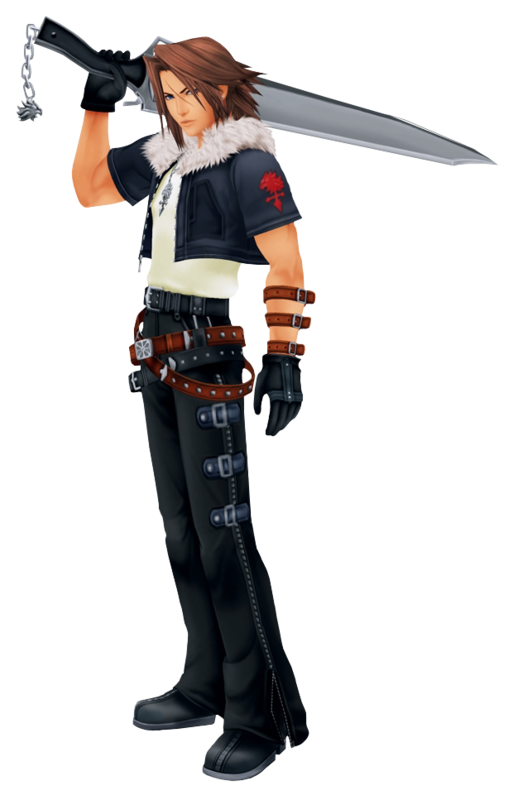 A Gunblade-wielding warrior hardened by the loss of his home to the Heartless to the extent that he has shed his original name in order to distance himself from the guilt, Leon served as Sora's ally during his first adventure, and has returned home to Hollow Bastion following the sorceress Maleficent's defeat. He is now working tirelessly towards restoring the kingdom to its former glory, and thus has created the Hollow Bastion Restoration Committee. As the leader of the Committee, Leon is responsible for recruiting new members and is determined to uncover the secrets hidden within Ansem the Wise's computer. He is instrumental in defending the town from a massive Heartless invasion, and later is charged with delivering an eradicator program that will destroy the MCP. When Tron takes over the database, Leon is reminded of the kingdom's true name: Radiant Garden. Though peace is a long way off, the thought that they are finally heading towards achieving that peace has finally brought a smile to his normally broody face.